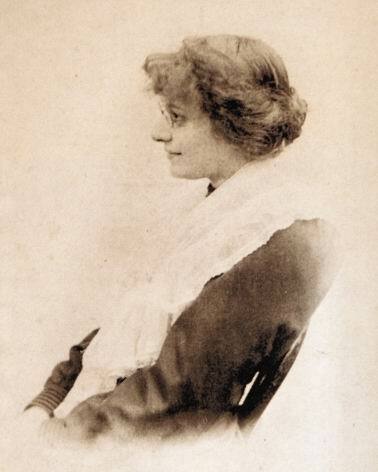 Eleanor Farjeon (1881-1965) was a children’s writer and poet, perhaps best known now for her hymn “Morning has Broken” (1931). She is pictured to the right as she was in 1913. The Great War was a changing point in her life, as she documented herself, not because of a direct involvement, but because of the effect on her of the death of her close friend the poet Edward Thomas in the battle of Arras on 9 April 1917. She was born on Buckingham Street in London, the third of the five children of Benjamin Farjeon, a prolific novelist, and his wife Margaret, who was from a theatrical family. Benjamin’s parents were orthodox Jews, running a secondhand clothing business on Mile End Road; Benjamin himself was an agnostic. The family moved to 196 Adelaide Road in South Hampstead when the children were young. As Eleanor (“Nellie”) grew up, she had the run of her father’s large library. In her account of her childhood, Portrait of a Family (1935) (later republished as A Nursery in the Nineties) she describes herself as “a dreamy, timid, sickly, lachrymose, painfully shy, sensitive, greedy, ill-regulated little girl […] intensely absorbed in my writing, my reading, my family and my imaginative life.” She added: “No wonder that many years later when I came to write books myself they were a muddle of fact, fiction, fantasy and truth.” She credited the roleplaying which she did with her brother Harry as giving her “the flow of ease which makes writing a delight”: this play-acting was very private, and they called it TAR (which stood for Tessy-and-Ralph, the two characters in the play (a pantomime called The Babes) which set them off, which Harry was eight and Eleanor was five. She began writing as a teenager, but when her father died, in 1903, leaving no money, writing became a more urgent necessity. She published volumes of poems in 1908 and 1916, and a book about the artist Arthur Rackham in 1914. Her first novel, The Soul of Kol Nikon (1914, revised 1923), is a fantasy for adults, about a changeling who tried to find a soul through music. But she did not really find her voice until after the Great War. Her first great success was Martin Pippin in the Apple-Orchard (1920), which she originally wrote to amuse Victor Haslam, an RFC officer in France, to whom she sent it in instalments. It and its sequels are collections of linked tales, in which Martin Pippin is a kind of trickster god, but also (as a Green Man) a vegetation god. In Edward Thomas: The Last Four Years, Farjeon writes that “it has always surprised me that, over forty years, Martin Pippin in the Apple-Orchard has come to be regarded as a book for young children” (254). During the 1920s she wrote a large amount of verse (one topical poem a day for the Daily Herald for thirteen years, one a week throughout the 1920s for Time and Tide), and also wrote various fantasies, inspired by fairy tales, some for adults and some for children. Her adult fantasies include Gypsy and Ginger (1920), in which two newlyweds begin to live in a house in Trafalgar Square, and listen to the animals and mythical beings in the city lament what Clute calls the “thinning” of their world. In The Fair of St James: A Fantasia (1932) the protagonists enter an otherworld in which a glorious fair is taking place; Ariadne and the Bull (1945) tells the classic myth in a modern American setting. Her best short stories for children were collected in The Little Bookroom (1955), which won the Carnegie Medal and the Hans Christian Andersen Medal. In her thirties she fell in love with someone, and wrote him sonnets. Her biographer Annabel Farjeon does not know who he was, although for a while she suspected Godwin Baynes, whom she certainly admired. He was “the sun-god of our brilliant circle. This giant rowing-blue from Cambridge (six-foot-four in his socks) with a heart and brain to match his physical prowess, was the most popular man I have ever known. When he was talking to you he compelled you to feel that you were more interesting to him than any other person in the room, and I still think that at the given moment this was almost true (Farjeon biography, p. 89). Annabel Farjeon notes that Baynes aroused “strong emotions and, quite often, disappointment”: this was certainly true in the case of David Garnett, as one can see elsewhere on this website. It was, indirectly, Godwin Baynes who connected Eleanor with Edward Thomas, for he was treating Thomas for depression; but actually it was her brother Bertie who introduced her. The opening words of Eleanor Farjeon’s book Edward Thomas: The Last Four Years (Oxford University Press: Oxford, 1958) are “One day, towards the close of 1912, my brother Bertie said to me, ‘Edward Thomas is coming to town tomorrow and wants me and Godwin to have tea with him. He has asked if you and Rosalind would come too’ (ET 1)”. For her relationship with Edward Thomas, see her “war experiences“. Eleanor Farjeon never got married, but she did live with George Chester Earle from 1920 until his death in 1949, and then had a relationship with Denys Blake, an actor twenty years her junior. She died in her cottage in Hampstead, at 20 Perrins Walk, in 1965, and since 1966 has been commemorated by an annual Eleanor Farjeon Award, which is given for distinguished service to children’s fiction (not just writers, but editors, illustrators and others). The basics of her life are described by John Bell (revised by Victoria Millar), in the Oxford Dictionary of National Biography 19 (2004); her entry is preceded by that of her father. I have also used Morning Has Broken: A Biography of Eleanor Farjeon by her niece Annabel Farjeon (London: Julia MacRae, 1986). I have drawn on the entry about her writing from the Encyclopedia of Fantasy.